Princess Leia as you've never seen her before! 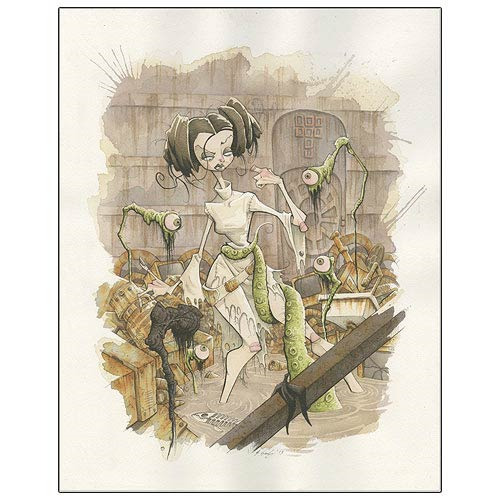 Stylized image of Leia versus the Dianoga in Star Wars. Inspired by the movie's exhilarating yet humorous trash-compactor scene. Unique art print on wood measures 14-inches tall x 11-inches wide. Limited edition of a mere 25 pieces worldwide! Now there's a view of Princess Leia you've haven't seen before! The Star Wars Princess Leia All Eyes On You Millworks Wood Print from Acme Archives is an entertaining piece of art inspired by the exhilarating yet humorous trash-compactor scene in the original Star Wars film. It features quite the stylized portrait of Leia ankle deep in sewage water, knee deep in piles of rubbish, struggling against the tentacled Dianoga menace that makes its presence known while Leia, Luke, Han, and Chewiee are stuck inside the Imperial Star Destroyer's compactor. A limited edition of 25 hand-numbered pieces signed by artist Grim Grisly, this wonderful image is printed on a 3/4-inch thick birch-wood plywood board that measures 14-inches tall x 11-inches wide. Here's lookin' at you, kid.